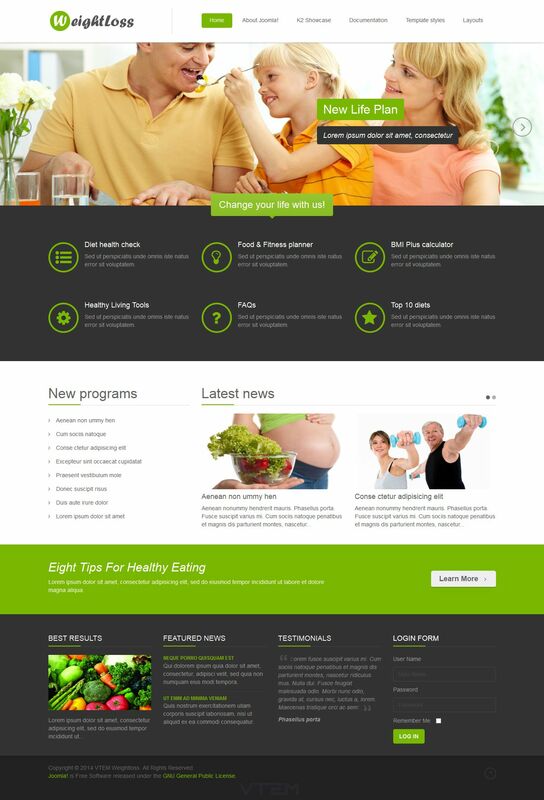 VT WeightLoss - new template for sites running CMS Joomla 2.5 and 3.0, developed by professional designer studio Vtem. Gorgeous design template includes 4 color schemes that are easily configured through the admin panel of the site. Using the capabilities of the new Web - technologies that are used in the template attached responsive layout features fast boot and overall optimization. This template is correctly displayed on various mobile platforms, and is also compatible with all browsers. Corporate image rotator at the top of the template will clearly display the most important information. Built-in support of the functional component content management K2 adds special functions and features in the publication and posting materials. VT WeightLoss - perfect solution for creating high-quality and modern Internet - resources.